Innovative computer tool gettings from the most asked for in download libraries! Use the popular software programs lists, learn the most recent refreshes of the cutting-edge softwares programs, and try forthwith! Do not lose chance to obtain the first class software: employ SoftEmpire directory to acquire software applications for free of charge. Meet the website of free utilities and software system demo versions. select among OS softwares, setup controllers, games, and all other kinds of programms for your notebook or digital accessory! If an important number happens to be busy, this application will recheck that number repeatedly for availability, for up to a user-set number of minutes. You simply press the dial button and provide the telephone number you want to call. If the line becomes free, you'll hear the ring signal. Just pick up your phone and start talking. You may also set the program to redial on ring signals too. This feature can be used for radio contests and call-in television voting. A good example is the very popular FOX television show "American Idol". Every successful call made is counted as a vote. 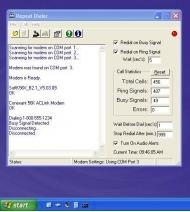 Once the call is completed, the call will be disconnected and the number will be redialed again. This program will also work on other popular Reality TV shows like "I'm a Celebrity - Get Me Out of Here! ", "Married by America" and other future reality television shows. The Repeat Dialer can make about 500 calls per hour. You can add a second modem to double the amount of calls. Up to 16 modems can be used. Oleco is a Low Cost Router for Dial-Up Internet Connections within Germany. Contains a large number of German Access-Providers that don�t need registration for Usage.